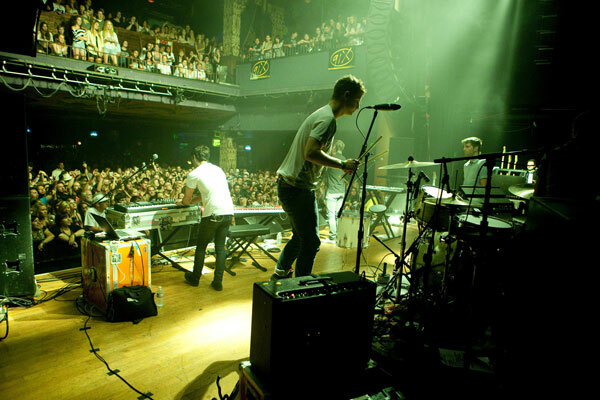 A behind-the-stage perspective of a Foster the People concert. Photo from FosterThePeople.com. With Chicago’s two biggest outdoor festivals in the books for 2011, we decided to turn our attention to the city’s fall concert schedule. This is part two. And if you missed it, check out the first part of our Chicago fall concert preview. There will probably be a part three soon. Tickets: Currently sold out. Available on StubHub for $55 and up. Why: The group’s infectious, light-hearted pop has turned this group into the breakout indie band of 2011, which was apparent at Lollapalooza. If you tried to see them at Grant Park and couldn’t get within 50 yards of the stage, you’ll be able to get a better view at the Riv. Song to Check Out: Helena Beat. Zola Jesus crawling on the stage, seducing her fans, or perhaps looking for a lost contact. From the Zola Jesus Facebook page. Why: Because the blond-haired songstress boasts a beautiful voice powerful enough to bench-press 500 pounds and seductive enough to make you her indie sugar daddy. We could go on, in fact we did last time she came to town, where we raved about Zola Jesus’ siren ways. Song to Check Out: Night. When: Thursday, Sep. 8 (yes, we realize this is still technically summer). Song to Check Out: When U Love Somebody. Why: While the group’s latest album isn’t our favorite, Okkervil River’s lead singer and lyricist Will Scheff remains one of the best and smartest song writers in the business. The band’s live performances are far more animated and amped than you’d expect from an indie folk band, which is perhaps why the group has graduated from playing smaller venues like Schubas to places like the Vic. Songs to Check Out: Westfall and John Allyn Smith Sails. Why: We just heard their song “Don’t Say Oh Well” in a Chevy commercial, and GroupLove’s “Colours” has been on heavy rotation on Sirius’ XMU, so it’s only a matter of time before this happy-go-lucky band of handclappers start playing much larger venues than Sub-T. See them now in a space that’s probably about the size of your apartment. Song to Check Out: Colours. Why: The Olso DJ masterfully blends beats to grove to — no bass thumping Jersey Shore-like samples here. Singer Christabelle lends her sultry lyrics to some of Lindstrom’s newer tracks, giving his songs an extra layer of sexiness. Song to Check Out: Baby Can’t Stop. Where: Paramount Theatre in Aurora. Why: Nostalgia? Because it’s now both hip to be square and ironic? Because your Mom couldn’t convince your Dad to go? Or most likely because hearing “Power of Love” live is worth dropping $50 and driving to Aurora. Song to Check Out: Hip to Be Square. Or watch this American Psycho clip that made people completely reconsider the context of the song.